Nick Pirog’s Thomas Prescott novels are worth reading just to watch a writer learning his craft. The first book in the series, Unforeseen, is even admitted by the author, in his introduction, to be a freshman effort. Still (I’m not sure why) he offers the Kindle edition without alteration. And yet… in spite of its faults I liked it enough to read the sequels, which show considerable progress and offer many rewards. 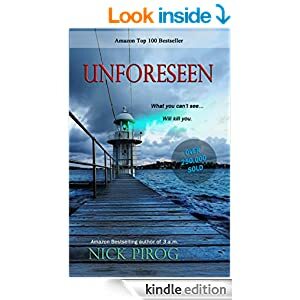 At the start of Unforeseen, Thomas Prescott, former cop, former FBI consultant, and current criminology professor and millionaire, is living in Maine with his sister Lacy, an artist with Multiple Sclerosis, and their narcoleptic pet pug, Baxter. Thomas is recovering, physically and emotionally, from a struggle with a serial killer which ended in a fall off a cliff into the ocean. Everyone thinks the killer is dead except for Thomas. Sure enough, soon identical murders begin to occur, and all the victims are women with whom Thomas has been, or is now, associated. The story is lively, though there are improbable elements, but the big problems are Pirog’s occasional bad diction (“The building was large, gray, and projected a cadence of death”), and a problem with the main character. Pirog’s trying to write a thriller with comic relief here, but he seems to think the formula for such a work is equal parts dramatic tension and jokes. Too many jokes, especially when innocent people are suffering, just comes off as callousness. 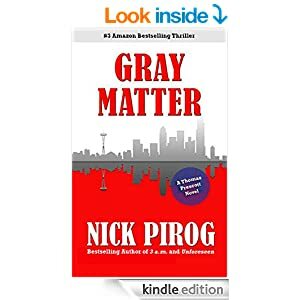 Still, I was intrigued enough to move on to the next book, Gray Matter. The story begins with Thomas having moved back to his home town, Seattle, and the family mansion, which stands on a cliff above a cove. He’s barely moved in when he looks down off the front porch and sees a woman’s body in the water below. He makes a dangerous descent to retrieve the body, then calls the police. The call is answered by a very attractive female cop, and an old enemy from the force whose nose Thomas once broke. Soon he’s under arrest for suspicion, but he gets out and starts investigating on his own. Gray Matter showed considerably improved craft on the part of author Pirog. Thomas is still a smart-aleck, but he knows when to turn it off now, which makes him more sympathetic. And the diction is much improved. I found the plot kind of complicated, but that didn’t put me off too much. 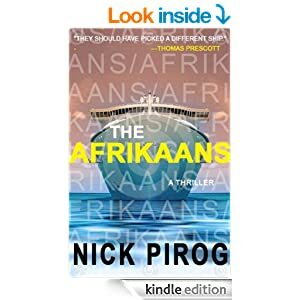 Finally there’s The Afrikaans, in which we find Thomas, Lacy, and (improbably) Baxter the pug on a luxury cruise along the coast of South Africa. The ship (the titular Afrikaans) is attacked and taken over by pirates. But Thomas soon learns that there’s more to this hijacking than a simple ransom demand. A complex (a little too complex in my opinion) dance of conspiracies and double-crosses is being choreographed by some of the most powerful, and dangerous, people in the world. This is the first book in the series to employ multiple viewpoints, and it works pretty well. Though I have to admit I miss Thomas when he’s off stage. The Thomas Prescott books are flawed but a lot of fun, and I recommend them. Cautions for language and adult situations, but nothing too intense.